On Monday a little bit of U.S. television history was made when KFPH UniMás 35 became the first station to go on air using the new ATSC 3.0 broadcast format in Phoenix, Arizona. Over the coming weeks, several more broadcasters will follow and the first wide-scale test of the new format will be underway. The format attempts to blend over-the-air TV with internet streaming, can support 4K broadcasting and localized emergency alerts, and should be more robust for city reception; but it also gives TV stations the chance to start serving personalized advertising. 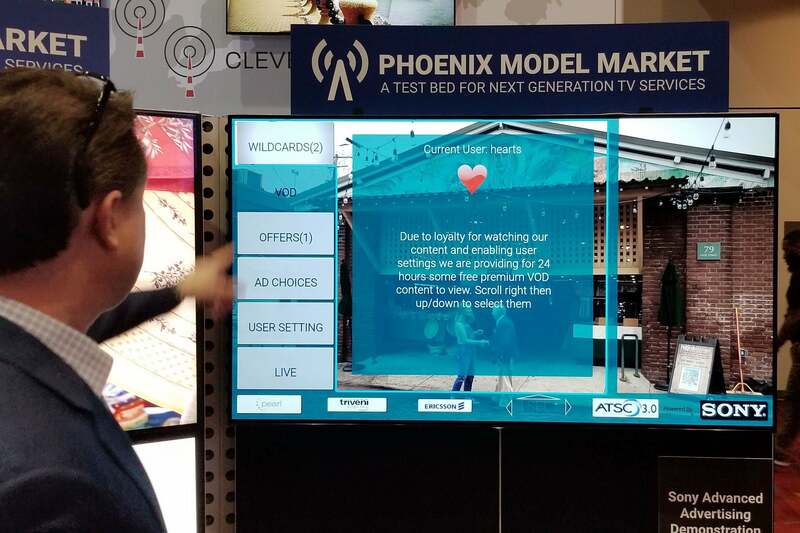 Broadcasters haven't talked much about the advertising aspect, and they've said even less about the potential privacy implications, but it was a major focus of several tech demonstrations at the National Association of Broadcasters (NAB) conference in Las Vegas this week. At the event, about 300 miles to the north of Phoenix, it was clear that TV stations are keen to use the new format to track more closely what viewers are watching and serve up the same kind of targeted ads that are common on the Internet. 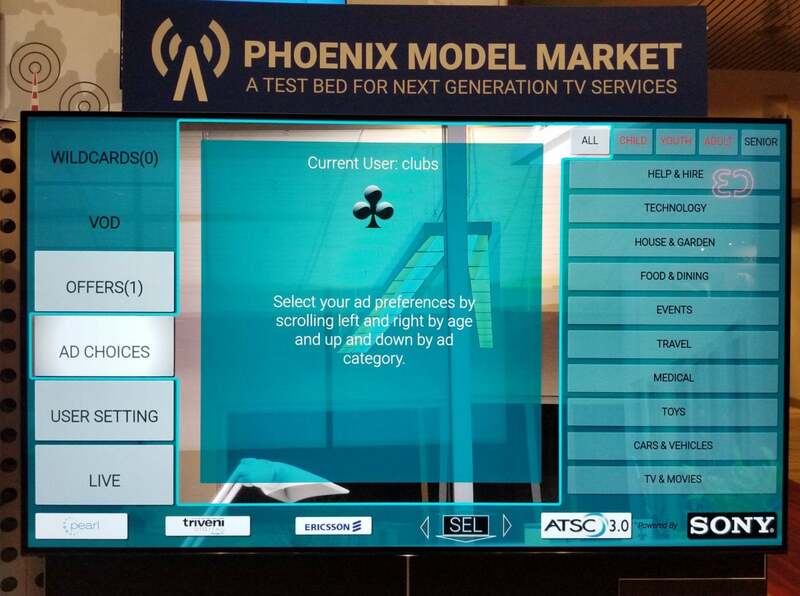 An ATSC 3.0 sample application on show at NAB 2018 in Las Vegas on April 10, 2018. 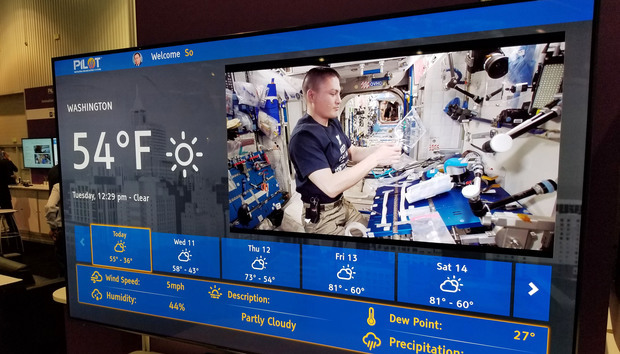 When viewers tune into an ATSC 3.0, the TV station has the ability to serve them an application that will run inside a browser on their TV. Viewers won't see a traditional browser window, it will look something like the images above, and because it's written in HTML5 it will work across all TVs. But the style of the app and the features it offers will be down to each individual broadcaster. Some might offer quick links to news clips and the weather and access to a catch-up service (i.e., video on demand that would let you watch previously aired programming you'd missed the first time), while smaller stations might just provide a TV guide. One thing many are likely to do is track exactly what you're watching and for how long. In a demonstration app on display at NAB, the TV tracked what a viewer watched and for how long. The pay-off for the viewer would be free or exclusive access to content. So, for example, imagine a future where a TV station gives you free access to premium content in return for being loyal to its newscasts. But the TV station would be getting more than loyalty. The data would be used to build a profile of the viewer and serve them personalized ads, delivered over the internet to their TV. That will be a lucrative new ad model for TV broadcasters--and that's why the TV industry is so excited about ATSC 3.0. 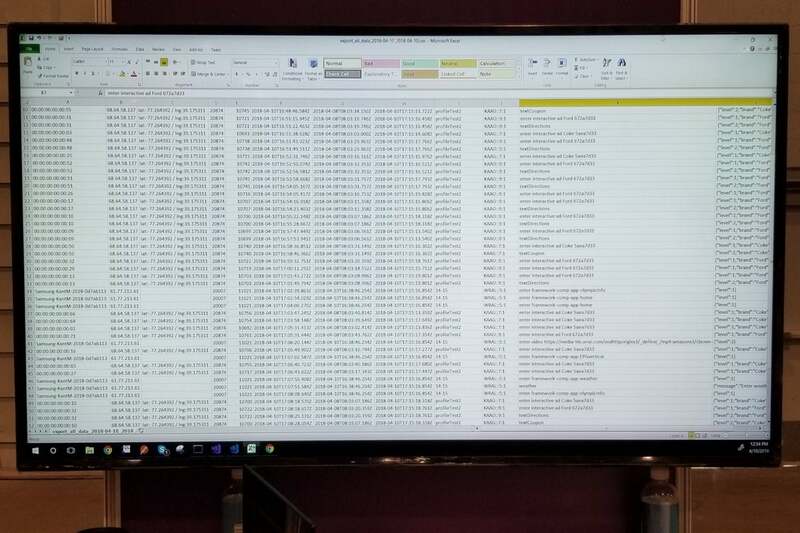 Sample data from an ATSC 3.0 application shown at NAB 2018 in Las Vegas on April 10, 2018. For consumers, the downside comes in a further loss of privacy as yet another aspect of our lives is tracked and exploited to sell us things. Can you imagine being a middle-of-the-road voter in a swing state when the election rolls around? If you thought political advertising was bad now, just wait until the campaigns get their teeth into targeting on this personalized level. It might be better to leave the TV off for six months. In the demonstrations I saw this week, apps were capable of tracking only what a user did inside the app in question. One station won't be able to see what you watch on a rival, but that gets blurrier in markets where a single owner operates several channels. It's worth remembering that ATSC 3.0 doesn't inevitably mean a loss in privacy. None of this matters if you don't hook up a TV to the internet, but then you forego additional services like catch-up.